It is precisely because relativity theory retained the ideas of Lorentz contraction and Larmor time dilation from Lorentz Ether theory (although with a different meaning), that relativity theory arrives at the same prediction as ether theory for the same experiment. Likewise, any new or modified ether theory needs to retain these ideas to be consistent with the experimental results. An example is the Ives and Stillwell experiment  - the reduction in the frequency of the canal rays from the high speed protons was proclaimed as being evidence of relativistic time dilation, conversely Ives himself stated, rightly so, that this was instead evidence for Larmor (mechanical) time dilation and a physical Lorentz contraction based on Lorentz ether theory. The two theories agree with the results, but for different reasons. To be consistent with the results, the ether theory requires Lorentz contraction and mechanical time dilation to be true. An ether theory without these two effects would be proven to be false by the same experiment. "Such is the origin of Einstein's statement ``God is slick, but He ain't mean'' It was made in response to a claim in 1927 that a tiny "ether drift" had finally been detected. Einstein rejected this out of hand: to have an ether which was almost undetectable (requiring special relativity to be almost correct), but yet present (undermining the foundation of relativity) seemed absurd to Einstein, and indeed his intuition proved right. But the comment can be taken more generally as an emotionally powerful justification for the central idea of relativity theory: that what cannot be measured, does not exist. God would not be malicious enough to hide an important part of reality in a way that we cannot reach; if no experiment can reveal the true rest frame of the ether, then there is no ether, and no frame of absolute rest. " From these statements we can take that relativity theory has never proved that an absolute rest frame for light (the ether) does not exist - rather, it has declared that it is by definition impossible to detect, and as such, does not exist! We do not agree - in the current world where a universal rest frame has been shown to exist (the Cosmic Microwave background (CMB) radiation) which is now used as an astronomical reference frame for the motion of all objects in the universe, and where clock synchronization has been shown to be possible (i.e. with GPS satellites), it is becoming more and more possible to distinguish between the two theories, and relativity theory, now over 100 years old, is becoming increasingly pressed in its own defence. Further, the idea that because something cannot be measured it does not exist, is an arbitrary scientific justification. Quantum Electrodynamics uses the opposite idea - that virtual particles can exist because their existence is too fleeting to detect due to Heisenberg's uncertainty principle (these virtual particles can also break the law of conservation of energy for the same reason), or the similar idea that particles are composed of quarks even though it is impossible to isolate a quark - this concept in physics is applied in a contradictory and inconsistent fashion as justification for whatever theory is in vogue, and is undermining the credibility of physics as a whole. It is precisely because of this that we feel current theoretical physics is going in the wrong direction, it is approximating the truth mathematically but failing to describe physical reality in a deterministic form. We reject the notion that an experiment is impossible, but rather accept that it is difficult. With sufficient progress in technology, theories once believed to be outside the realm of practical testing will surely succumb to experimental rigor. Theories obeying the Lorentz transformations (ether theories, relativity theory) should be experimentally distinguishable and capable of being proven true or false. But to begin this task, we must first understand how ether theory can be consistent with all the experimental evidence to date. We will start with an explanation of how there could be a medium of space (a preferred frame for light) and light would still appear to be C to all inertial observers. This explanation is largely based on effects that were well described immediately prior to the advent of relativity, such as the Fitzgerald-Lorentz contraction and the Larmor time dilation effects. We start with the idea that space is a medium of some kind. This was James Clerk Maxwell's basic assumption when he theorized that light and electromagnetic waves are the same thing, waves in a medium of space. electric permittivity of space (Eo). It follows then that the speed of light has a specific velocity because this is the velocity of transverse waves in the medium of space, and this velocity is a function of the elasticity and density of this medium. Conversely, if space was a true vacuum, there would be no specific velocity attributed to light, since the only property of emptiness is that it has no properties. 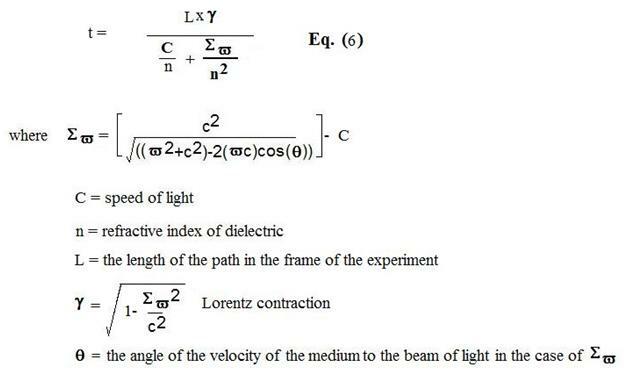 2) If light is a transverse wave in a medium, how do we calculate the speed of light with respect to a moving observer? If we were to imagine that we the observer are immersed in this medium, and light waves are waves in this medium, and we start to move at some velocity, what would the speed of light be with respect to us? 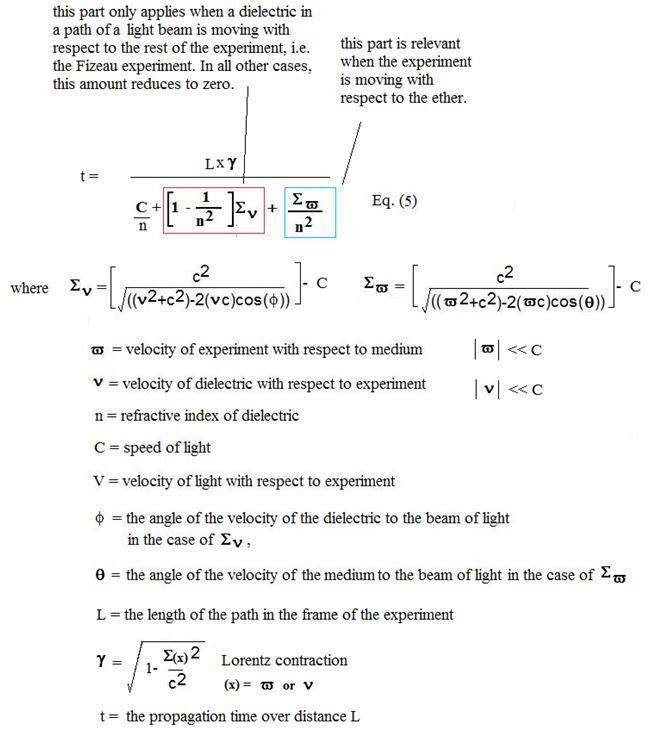 If light is moving at velocity C with respect to the medium (the page) and I am moving at velocity A also with respect to the medium, then the velocity of light with respect to me is simply C- A ( the difference). Similarly, if I am moving in the opposite direction at velocity B, then the difference is now C+B. Now C, V and L correspond to the time taken to cover each path. Since V points against C by a small angle, the time to traverse L is less than the time to traverse C. From the perspective of the observer moving along V, since the time L is less, then the observed velocity of light is more than C.
The observer and a laser are on the Earth. The laser is pointing south. If the observer runs with the laser west at 3m/s, what is the velocity (C') of the beam of light with respect to the observer? The angle q between the beam and the velocity of the runner is 90 degrees. Using Eq. 2 and plugging in the values: C' = 299999999.999999985 m/s. Example 2: time' = time x (1-v2/c2)1/2 = 1 x [1- 32/(3E8)2 ]1/2 = 0.99999999999999995 seconds. After accounting for the slowing of the clock, the velocity is now seen as exactly C. This mechanical slowing of the clock is a conspiracy of light - it is a self-correcting process of light where the obvious change in the apparent velocity of light due to the transverse velocity of the observer is perfectly cancelled by a change in the speed of light in the clock of the observer, due to it moving at the same velocity. This was recognized early on by Joseph Lamor (1897). The observer and a laser are on a plane. The laser is pointing west. If the observer flies with the laser in a plane west at 300m/s, what is the expected velocity (C') of the beam of light over the path from the back of the plane to a mirror at the front? The time is longer since the mirror is receding from the beam, so the velocity appears to be slower. since less time has elapsed due to the observer approaching the oncoming beam. Thus the one way velocity of light appears to be C+/- v, depending on which was he flies. The average velocity is C. This is a conspiracy of light (first order) in that although the one way speed of light is not C, the two way speed of light averages to C since the observer cannot be at the front and back at the same time. Thus the two way measured speed of light is C, the difference being obscured by two conspiracies of light: 1) the mechanical time dilation and 2) the Lorentz length contraction, both second order effects. where v is the velocity of the dielectric. This is latter expression is essentially the equation that Fizeau had worked out. w = 3m/s, the equation reduces to V = c + 3*(0)/1 = c. As can be seen, the effect of the transverse velocity of the observer (i.e. when the observer is moving perpendicular to the light beam direction) does not figure in the Wilhelm equation, which would be C - 1.5 E -8 m/s, a very small second order difference, but very relevant in sensitive optical experiments such as the Michelson and Morley experiment. Nor is the counteracting effect of mechanical time dilation taken into account. Further, when the velocity of the observer and the beam of light are parallel, wcosf = w (since cosf =1) and if we were to simply average the velocities forward and back along the path L, we would get an average velocity of C and would not see the small second order time difference shown in example 3 that leads to the round trip velocity of light being 299999999.99970 m/s rather than C.
We therefore modify the equation as follows by adding in the law of cosines equation developed in Eq. 2. 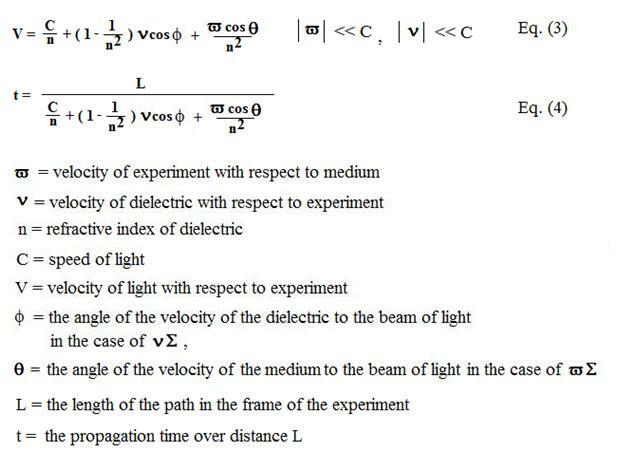 Further, we must calculate the result in terms of propagation time along the path rather than by calculating the velocity along the path, since we cannot simply average the velocities without taking into account that the effective path L is different from the perspective of the light beam fixed to the medium. The sign of the velocity (v) depends on whether the velocity is that of the observer, or that of the apparent ether wind and the observer is taken to be stationary. The effect of mechanical time dilation is not part of this equation, and is applied later as required. For interferometer experiments where we are looking only at the phase difference between different beams of light, mechanical time dilation cancels in the result since both beams are observed in the same velocity frame at the detector. for most interferometer experiments excluding the Fizeau experiment. Wang points out that: "The travel time difference Dt = 2vDL/c2 in our experiment is independent of the refractive index n, as in the Sagnac type experiment." This is because n2 cancels out in the numerator and denominator, making the Sagnac device independent of refractive index n.
This equation can now be applied to the various experimental results of interferometer test carried out in the last 150 years to see if theories that call for a preferred frame of reference, such as the Lorentz Ether Theory (LET), and Gravitational Frame Dragging Theories (GFD) yield the correct result. The results obtained can then be compared and contrasted to the predictions of relativity theory for the same experiments. This is performed in the next series of papers on this website. 1) Tyapkin, A.A., (1973) "On the Impossibility of the First-Order Relativity Test." Lettere Al Nuovo Cimento Vo. 7, No. 15, 760-764. 2) Herbert Ives and G.R. Stillwell (1938) An Experimental Study of the Rate of a Moving Atomic Clock. JOSA 28,No.7, 215-226. 3) H. E. Wilhelm, (1992) Galilei Covarient Electrodynamics of Moving Media with Applications to the Experiments of Fizeau and Hoek. Aiperon 15,1-6. 4) Ruyong Wang, et.al, (2003) "Modified Sagnac experiment for measuring travel-time difference between counter-propagating light beams in a uniformly moving fiber", Physics Letters A, 312 7. 5) Janssen, Michel, Stachel, John, The Optics and Electrodynamics of Moving Bodies. 2004.